Pablo Picasso, “Les Demoiselles d’Avignon,” Paris, June-July 1907. NEW YORK — Through the lobby thronged with tourists, the line for tickets, the line for the cloakroom, and the line for the ticket taker, up the narrow escalators, past the cafe and bookshop on the second floor, the photographs and drawings on the third, and the installations in progress on the fourth, we finally arrive at the fifth floor of The Museum of Modern Art. Vincent van Gogh, “The Starry Night,” Saint Rémy, June 1889. On GitHub, an online data and code hosting service, sits the entire MoMA collection: 123,919 pieces, including 1,656 sculptures, 28,411 photographs, 11,420 drawings, 1,936 films and — most important for our tour today — 2,229 paintings. One of the rows in this giant spreadsheet: ObjectID 79802. For each piece, the database tells us the work’s title, some brief biographical information about the artist, the year of creation, the medium and dimensions, and how and when MoMA acquired it. These aren’t exactly trade secrets: It’s basically the data printed on the placards posted next to each painting. But, in MoMA’s case, it’s assembled in one place, comprehensive, easy to use, and recent. The museum made the database freely available online last month. At the museum today, we’re armed not only with our love of art, but also with this big pile of data. We’ll appreciate the beauty, to be sure. But if you have questions, I’ll also turn to the hard numbers for answers. “Les Demoiselles” is Pablo Picasso’s imposing, proto-cubist masterpiece. It wasn’t easily accepted in its day. The painting puts the viewer on the client’s couch in a brothel, facing five naked prostitutes. When painting it, Picasso was “drinking turpentine and spitting fire,” imagined his contemporary and fellow cubist Georges Braque. Henri Matisse thought the painting was ridiculing modernism itself. In 2007, Newsweek declared it the most important work of art of the previous 100 years. “Les Demoiselles,” finished in 1907, would help usher in the cubist revolution — and spur a productive competition between Picasso and Braque. So, in such an oft-shifting century for art, how does MoMA maintain a collection representative of all modern art has to offer, both the earlier works and the contemporary? The figure below shows the paintings MoMA has added to its collection each year and when the additions were painted. 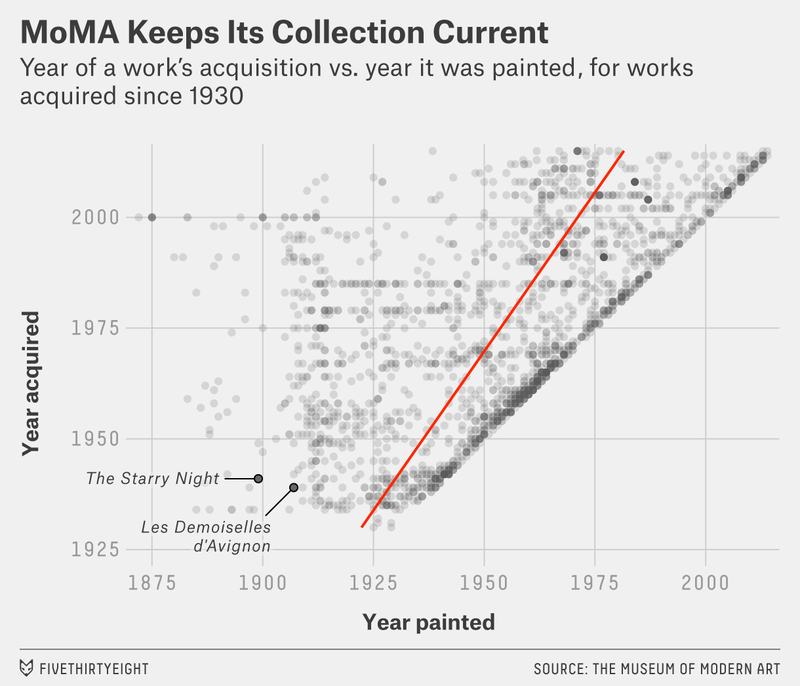 The red regression line shows the “modernizing” of MoMA’s collection — how quickly the museum has moved toward acquiring recent paintings. MoMA’s official mission is to aid the understanding and enjoyment of “the art of our time.” And judging by its acquisitions, it’s succeeding. It has established a solid body of works from the late 19th and early 20th centuries and occasionally still reaches back to acquire something older. But its focus is new work. As you can see from the thick blanket of points at the frontier of the scatter plot, much of its yearly acquisitions are of recent pieces — the art of our time. Still, the average acquired painting was painted about 30 years before it joined MoMA’s collection. The oldest painting in MoMA’s collection is “Landscape at Daybreak” by Odilon Redon, completed in 1872. (A commonly cited milestone for the “birth” of modern art is the exhibition of Édouard Manet’s “Le Déjeuner sur l’Herbe” at the Salon des Refusés in 1863.) MoMA acquired it in 2000. The most recent are two paintings from just last year: “Invisible Sun” by Julie Mehretu and “The Myriad Motives of Men” by Lynette Yiadom-Boakye. Onward. Two galleries away, as the selfie-mad mass begins to thin just a bit, a large, cool blue but kinetic scene by Matisse dominates the room, drowning out Matisse’s own “Composition” and “Music (Sketch),” which try their best to accompany it. Henri Matisse, “Dance (I),” Paris, Boulevard des Invalides, early 1909. This is “Dance (I).” It’s the earlier of a pair of paintings that Matisse made in 1909 and 1910. MoMA’s painting is a study for the later picture, which hangs in The Hermitage in St. Petersburg, Russia, and which the critic Hughes called “one of the few wholly convincing images of physical ecstasy made in the twentieth century.” Not bad, eh? By this point, we’ve seen the work of some real rock stars: van Gogh, Picasso and now Matisse. Everywhere you look in this place, a masterpiece, it seems. But what painters really do make up MoMA’s collection? Let’s find out. The “top 10” artists by works in MoMA’s collection are in the adjacent table. Indeed, a couple of the biggies we’ve seen — Picasso and Matisse — top the list. (There are just three van Goghs in the collection.) There are some less familiar names here, too. On Kawara, for example, is a Japanese artist who died last year. He did a large series of pieces each titled “I Got Up…” that were gifted to MoMA in 1991. Fight through the museum fatigue, because it’s time to move on. Through the next room you’ll find Picasso’s “Three Musicians” and a wall of Piet Mondrian’s neoplasticism. Keep going, and you’ll see a garden of Constantin Brâncuși sculptures. After that, it’s Rothkos, Klines and a de Kooning. From there, take two rights, wind through one more gallery, and you’ll finally find yourself standing in a pond. Or so Claude Monet would have you feel. His two large, luminous “Water Lilies” flank Gallery 9 — an otherwise darker and more intimate room than those on the rest of the fifth floor. Claude Monet, “Water Lilies,” 1914-26. Is this the biggest painting in the collection? Surely it must be. Again, a great question. But it’s not quite. The largest painting by area (by far) is the 861-square-foot “F-111” by the American pop-artist James Rosenquist. The smallest is an itsy-bitsy, 2.8-by-2.3 inch image of Jackie Kennedy by Richard Pettibone, a well-known miniaturizer of other famous artworks — Andy Warhol’s in this case. Here’s what MoMA’s paintings would look like if we placed them one in front of the other against a wall in the corner of an enormous room. 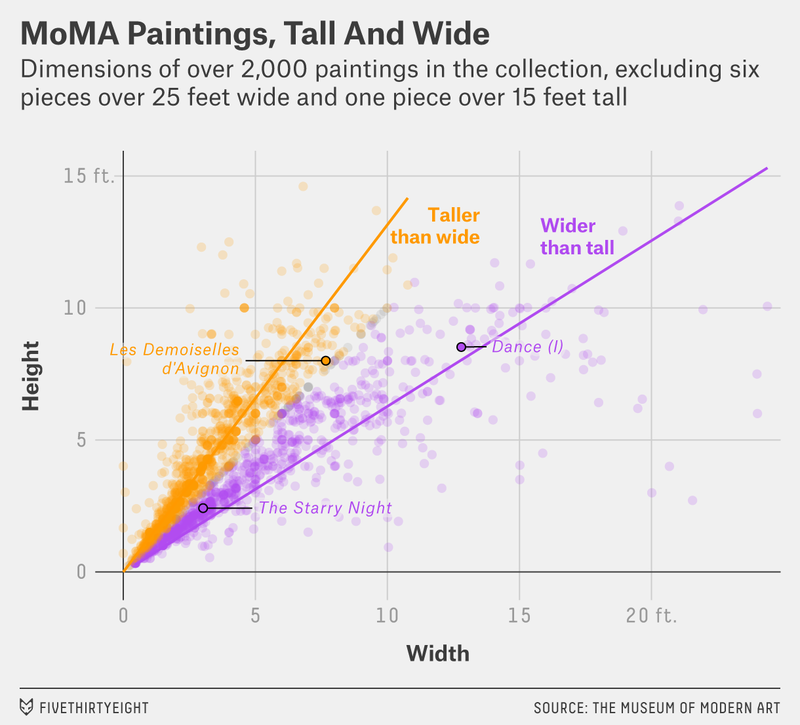 While there are a handful or two of outlying mega-paintings in MoMA’s collection, as you can see, the vast majority of paintings have more practical dimensions. Let’s zoom in a little to get a better sense of the size — and shape — of prominent modern paintings. How do the blockbuster paintings we’ve stopped at today compare, geometrically, to the rest of the collection? There are 956 paintings that are wider than they are tall and 1,079 that are taller than they are wide. There are 131 square paintings. Width is less constrained than height — walls where paintings hang are usually wider than they are tall. 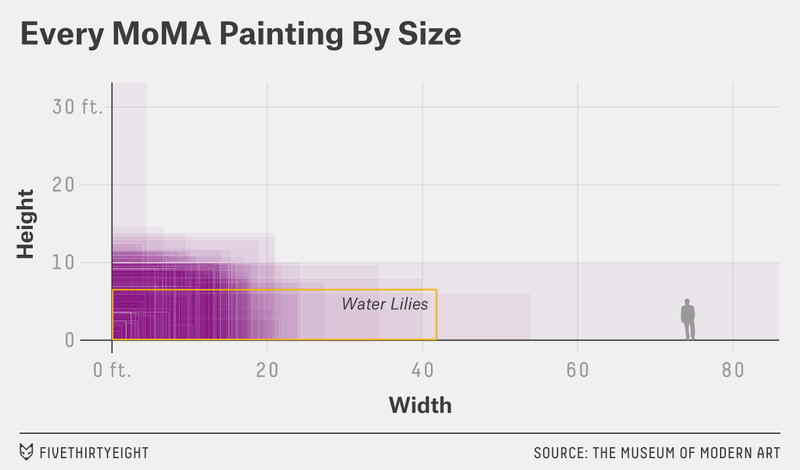 “Wide” paintings tend to be about 50 percent wider than tall; “tall” paintings tend to be about a third taller than wide. The larger “Water Lilies” picture is over six times wider than it is tall, capturing that endless water without bank. OK, I’m beat! Thanks for coming with me to the museum today. I hope you had fun. Let’s check out the gift shop. And then grab a drink — all that water talk made me thirsty. I know a place. For this table, I’ve simply tallied the medium categories exactly as they are recorded in MoMA’s data set.